Can bullying cause the same detrimental effects on dogs as it does on humans? The answer is, of course it does. The level of effect it has on a particular dog is based on several factors. 1) Does your dog have a lot of good play experiences with various dogs? Dogs that have lots of good experiences playing with other dogs have a better chance of bouncing back from a bully experience. 2) Does he have good play experiences with other dogs of similar type to the dog that was bullying? For instance, you have a small dog that has played with lots of other small dogs, but very few big dogs. If in an early experience with big dogs she gets bullied (it’s a bad experience for her), she could develop a fear of bigger dogs. This sometimes also happens with dogs of a particular breed or coat color. Dogs are very capable of discrimination. 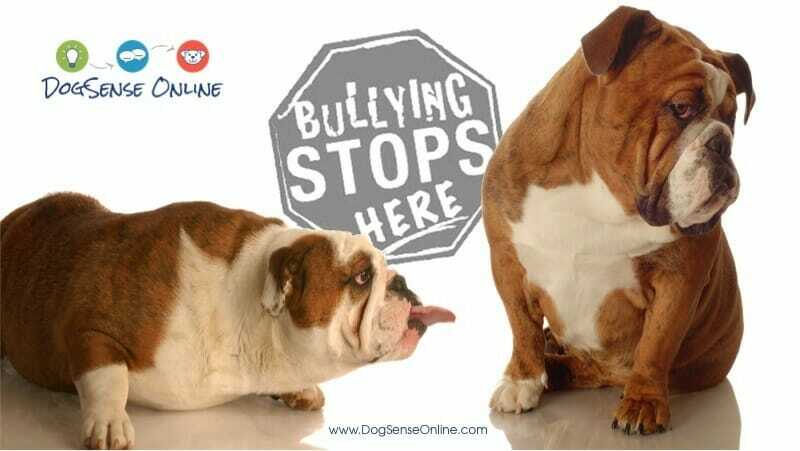 3) Do the bullying incidents for your dog outweigh the good play experiences? No different from us, when the bad experiences outweigh the good experiences, we can become more moody about certain situations. So do dogs. If you believe your dog is being bullied, be your dog’s hero always. Help get him out of the situation and take him away from that dog. Then, ensure his next play experience is a good experience. There are lots more opportunities for dog bullying to occur today. Dogs go to dog daycare and attend dog parks. Both dog daycares and dog parks have experienced rapid growth over the past ten years. 1) What do first time greetings with another dog look like? Most dogs prefer cautious approach upon a first meeting. Typically two dogs that do not know one another will approach and sniff the others back end and circle one another, working up to the face for more sniffing. Dogs that approach quickly and forego the acceptable greeting will get snarked or snapped at often. 2) How does your dog initiate play? Unfamiliar dogs do best when one of the dogs signals a play face, a play bow and other play signals. Sometimes it’s a little pounce into the air directly in front of the potential play mate. Play gestures and signals prior to jumping into the game of bite, wrestle or chase is your dog’s way of saying “do you want to play with me?” Some dogs go straight in for that playful biting, wrestle game or chase. Think about it, how would you feel if a total stranger came running up to you, no introduction, and starting chasing or grabbing at you? Terribly uncomfortable for most. 3) Does your dog give short little pauses in play and change up the game? When dogs are in play, things go best when both dogs take short pauses in the game. A lot of the games they are playing are similar to what dogs do in a fight, they are just toned down and fun when it is play. Dogs take short pauses, to catch their breath and to deliver more of the signals saying “We’re just playing here dude, right?” They switch things up, one moment playing chase, the next a little wrestle or neck biting. If you ever wrestled with siblings or friends when you were young, you’ll understand being pinned under someone for too long starts to get stressful. Some dogs get stuck in that pinning pose or bite at the neck in a continuous thrusting fashion. Most of their playmates are not going to respond well to this. Once dogs become more familiar with one another and good friends, they do less changing up of the game and pauses. Early on with unfamiliar dogs we want to see game changes and pauses. What if your dog is a bully? Does your dog have poor social greetings or play style that get him into trouble with other dogs often? Does your dog appear to target certain dogs leading to squabbles or fights, yet plays fantastically well with others? Good news, there are tried and tested methods that have excellent success rates for teaching your dog better greeting skills and better play skills. If your dog goes to dog daycare or the dog park, don’t fall into the terribly inaccurate message that dogs should be left to work it out. The more you allow your dog to rehearse these behaviors the harder it will be to fix. Dogs do not grow out of these behavior problems. They need to be taught. Some dogs bully for sport, they enjoy the roughness and rarely pay much attention to the cues another dog is attempting to give. Some dogs just get stuck in a particular type of play, often not quite yet understanding there are other ways to play that will get them more of it. Some dogs just have too much pent up energy and will play much better once some of that energy is spent. A qualified professional in dog behavior can assist you with figuring out exactly what needs work for your dog and get a plan in place to help. In the meantime, let your dog know when he’s doing it right! Praise him when he is playing nicely, let him know he’s got it right. When he gets it wrong, say “too bad” and follow immediately with the consequence, no more play for you. Some dogs it takes just a few minutes on leash to settle down a bit. Some dogs it takes leaving the dog park entirely for that day. Bottom line, do not let your dog continue to dampen everyone else’s good time. Take the time to fix it! So you, your dog and others can have a lifetime of more joy together. Dog daycare and dog parks are wonderful enrichment and social opportunities. If someone from the dog park or your doggy daycare talk to you about your dog being a bully, don’t get offended. Take action and find out what it takes to fix it. P.P.S. Don’t miss our local services in Minnetonka, Minneapolis & Edina, MN areas providing In Home Puppy & Dog Training and Minneapolis Puppy Classes for the social family dog.